“Is this what they do in industrial labs?”. seiri – Sorting – refers to the organization of tools, parts and instructions and removing anything that is not required at that workstation. seiton – Straightening or Setting in order – arranging the tools, parts and instructions to make the most frequently used ones the most easily accessible. seiso – Sweeping or Shine – maintaining a clean workspace and ensuring everything is back where it belongs at the end of a shift. seiketsu – Standardizing – all workstations are identical for a given job so that anyone can use the space and find what they need, and everyone knows their responsibilities with respect to the 5S system. shitsuke – Sustaining the practice – everyone adheres to the 5S system and everyone can suggest ways to improve the workspace and workflow for continual improvement. 5S methodology is so prevalent, there are even stores dedicated to selling materials for it. So what does 5S have to do with research labs? Dr. Peccoud thought that adopting the 5S system in labs would improve productivity and he charged David with adopting 5S for a research lab environment and implementing the system. I have to admit, I was sceptical about the merits of 5S in an academic lab setting. I’ll have to tell you a bit about my background to understand my reaction to 5S in a lab. I have worked exclusively in molecular biology labs for over 20 years. Molecular biology/biochemistry “wet labs” tend to be messy. This is because there are multitudes of bottles containing all manner of growth media and liquid reagents, carboys full of buffers, and equipment for running submersed DNA and protein gels. All of this means that molecular biology labs tend to be … well, wet. They range from organized messes to all-out “what’s growing on your bench top?” messes. My scepticism of 5S came from two sources – I doubted that a large wet lab could be maintained in pristine condition given the nature of the work and the emphasis on data rather than process, and I saw absolutely no correlation between lab cleanliness and the success of the lab, so what was the point of trying to maintain a pristine lab. On the plus side, it might just improve the lab gestalt. I learned pretty good habits in grad school and always kept a relatively clean bench, but common areas were always a bone of contention among lab mates. So, I was open to any attempt to maintain total lab cleanliness and organization, but justifiably sceptical about its effectiveness. The bench top tape outlines and cupboard/drawer labels seem obsessive-compulsive, but they serve their purpose. They are part of the Setting in order. I have spent weeks in a new lab constantly pestering the lab veterans about the locations of items in the lab. When I first got to the Peccoud lab, I think I might have asked for the location of something about 3 or 4 times, and that was only because drawers were still in the process of being labeled. Score one for 5S -several hours for productivity, especially for lab newbies. Also, the things that often go missing from benches, such as pipettors and tip boxes, are always where they are supposed to be. This is partly because a missing item stands out like a sore thumb when it isn’t in the taped outline. It reminds me of a murder scene with the chalk outline of a body that once occupied that space. Moreover, items tend not to “wander” because of the Standardized benches which all have a full set of tools and supplies. What also stands out on benches and desks are items that aren’t supposed to be there – that’s part of Sorting. Score another for 5S – a few minutes every day not having to track down tools or supplies. The Shine is relatively easy when everything is kept in place. We keep 70% ethanol and/or 10% bleach bottles (outlined with tape of course) within easy reach of every work surface, and equipment and tool locations are designed to leave lots of room for spills and wiping up. Also, we divide up the spaces among the lab workers and assign a person to be responsible for maintaining each area. Say goodbye to lab slobs! The key to keeping 5S from falling apart is a system of daily inspections and weekly audits. The labs should look identical at the beginning and end of the day. We have reusable laminated inspection sheets with 10 items to look for – ranging from floor cleanliness to proper documentation. Each lab worker is responsible for performing an inspection of their assigned area at day’s end. Each item on the sheet gets a score of 0-5 (5 being completely compliant), so that people can improve upon the deficiencies and persistent problems can be identified. The inspections are also part of the kaizen – continual improvement – efforts of the lab. The weekly audits are performed by someone in the group who doesn’t work in the lab, which helps identify problems that lab workers overlook or don’t normally see as problems, but should. The main tool for continual improvement is the implementation sheet. When someone comes up with a more efficient way of implementing 5S (e.g. moving a piece of equipment to a more convenient location), they fill out an implementation sheet stating the desired change and the benefits of the change. These are usually obvious enough to be adopted without discussion, but if the change has the potential for controversy, a consensus is reached among the lab workers. I have to admit, there was one aspect to the 5S system I didn’t initially like – communal workbenches. We are not supposed to keep personal solutions on the bench shelves because, theoretically, anyone can use any bench. I like the standardized benches for the reason given earlier, but not the communal bench philosophy, which is unrealistic and unnecessary. Rarely is everyone in the lab using the same protocols at the same time, so everyone needs their own reagents. Moreover, there are no work shifts sharing the same workspace and tools, and most labs have designated bench space for each worker (this is not to say “sufficient bench space”, which is a whole other issue). Nevertheless, I have learned to appreciate using a cupboard for all my personal solutions as it keeps the benches and shelves less cluttered and easier to clean. However, I have not adopted the communal bench mentality and always use the same bench with my temporary notes, stationery, pens, markers, etc. in the drawer of that bench. Now, I’m not saying that adopting 5S for academic labs will drastically boost productivity like it did for industrial applications. Based on my own experience over the last 8 months, I’m guessing I’ve saved several hours through better lab organization and cleanliness. However, our 5S system has other benefits that are less tangible, but just as important for productivity. For example, it should reduce tensions between the Felix Ungers and Oscar Madisons of the lab. * I say “should” because this is theoretical. At the moment, everyone in my lab is a Felix (said the Oscar). Also, it’s just much more relaxing working in a clean and neat environment. I worry less about contaminating cultures and solutions, and we could pass a safety inspection at any time. This is certainly a change from any other lab I’ve worked in. 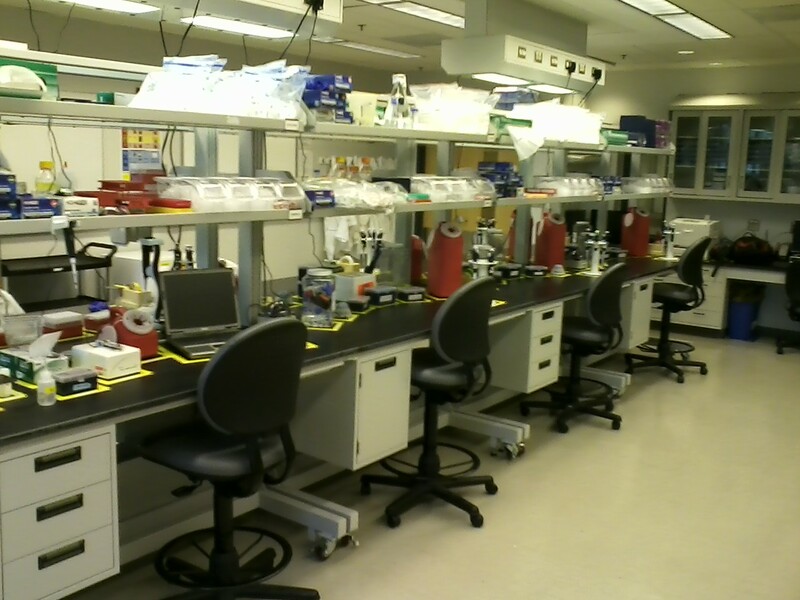 Gone are the days of scrambling to clean and organize the lab upon news of an impending inspection. Also, we don’t need an annual lab clean-up day(s). There is one major drawback to implementing 5S in the lab – the lab is so clean at the start and end of the day, it looks like no work is getting done! If you implement the 5S method in your lab, and plan on giving anyone a tour of the lab, do it at a time when people are in the lab doing experiments. So while 5S in the laboratory setting probably won’t turn a lab into an overnight success, it could increase productivity and it definitely fosters a healthier work environment. *First a reference to an 80s movie and now a reference to a 60s movie/70s tv show. Oh well, I am the old dog of the title after all.